For 13 years, Harmon Killebrew (affectionately nicknamed "Killer" in contradiction of his easy going nature) provided “gifts” to Minnesota Twins fans in the form of skyrocketing home runs and gift-wrapped double plays. Today, at 72 years of age, he remains an extremely popular and active member of the Minnesota community and is known for making regular appearances at area hospitals and non-profit organizations, including the Courage Center in Minnesota. 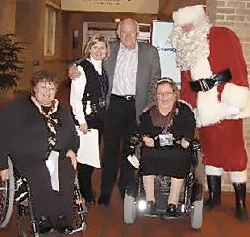 During one of his holiday visits to the Courage Center, Harmon was accompanied by another “bigger than life” character when he and Santa Claus made the rounds to spread holiday cheer to individuals with spinal cord injuries, brain injuries and stroke, as well as people with congenital disabilities such as spina bifida, cerebral palsy, muscular dystrophy and other neuromuscular conditions such as multiple sclerosis. "Life is precious and time is a key element,” said Killebrew. “[I try to] make every moment count and help those who have a greater need than our own." In keeping with the mission statement of his Harmon Killebrew Foundation, a nonprofit 501(c)3 founded in 1998 with his wife Nita, he works to enrich the quality of life of people of all ages by promoting positive and healthful participation in sports, specifically baseball.